Could this photo get any more meta? My motion-activated camera capturing me taking a photo of a female flushing from her nest. This year, I visited 26 gravel rooftops in North Sioux City, Elk Point, Vermillion and Yankton, SD, and found 30 nests. This is great! In 2015, I had 20 nests, and in 2014, I had 13 nests. I expect 2017 to be my last year in the field with nighthawks. Thanks to all the property managers who’ve allowed me on their rooftops! Thanks to Bob Garner and Joe Madison for lending their motion-activated cameras to the project. Common Nighthawks have one of the longest migrations of any bird. Of course, there are champion migrators like the Bar-tailed Godwit. But Common Nighthawks have a long way to go every year. At Florida Keys Hawkwatch, they have reported large flocks as well. Check out their video here. “I wouldn’t claim that the observation of ‘thousands’ of nighthawks at the Cheyenne 30 years ago vs. 200 last weekend indicates any trend in numbers. Those were two singular observations with no other similar records to compare with. Also, the 200 number is a careful, accurate count but the one in 1986 wasn’t. I remember it as ‘thousands’ of birds but I can’t really say for sure how many there were. When my friend and I got to the river we saw what seemed like a continuous stream of the birds flying south on the west side of the river valley. As we continued down to the river, standing by the stream with the cottonwood forest around us, we noticed there seemed to be as many flying north, generally on the east side of the valley. I assume the nighthawks were flying in a great circle over the valley–some were still flying south, also. There were definitely hundreds of them, but it’s quite possible I inflated the numbers in my memory over time. Nonetheless, I think we can confidently say nighthawk populations are dwindling. North American Breeding Bird Survey data from 1966-2007 indicate a declining population trend for Common Nighthawks in North America, with a -1.8 % decline annually for both North America and South Dakota. The South Dakota trend from 1980-2006 was -4.3%, showing an accelerated decline relative to 1966-1979 (-0.9%, Sauer, J. R., J. E. Hines, and J. Fallon. 2007. The North American breeding bird survey, results and analysis 1966 – 2006, Version 10.13.2007 [Archived]. Laurel, MD: USGS Patuxent Wildlife Research Center). This amounts to a 58% decrease in the U.S. since the 1960s and a 80% decrease in Canada. 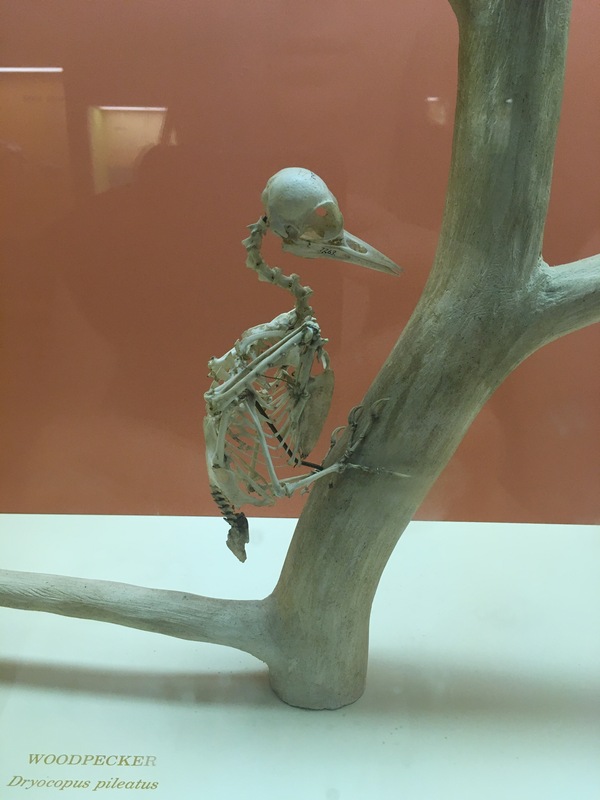 I visited the Smithsonian Museum of Natural History last week and found their Common Nighthawk skeleton. Check out the keel on that bird. The keel is the plate-like structure protruding from the bird’s chest. It’s the attachment point for the flight muscles. Keels are enlarged for birds who have to take off fast, like pigeons. They are non-existent for flightless birds like ostriches. What this says about nighthawks is the importance of their ability to flee suddenly from predators from their ground-nest habitat. Like urban pigeons that scrounge on the ground in the park but somehow always evade pedestrians, nighthawks need to make a fast get-away. Besides, with their long wings, it requires some extra structure for muscle attachment. Check out the keels on these arboreal birds for comparison. The second thing I noticed about this skeleton: Nighthawks, like their nocturnal nightjar brethren, have extraordinary vision. Thus, their eye sockets take up a greater proportion of their skulls than the diurnal cuckoo and woodpecker. Those enlarged sockets house large eyes that can gather light in the night. I spent many nights trying to capture nighthawks with mist nets. Their ability to see in dim conditions enabled them to evade my nets night after night. 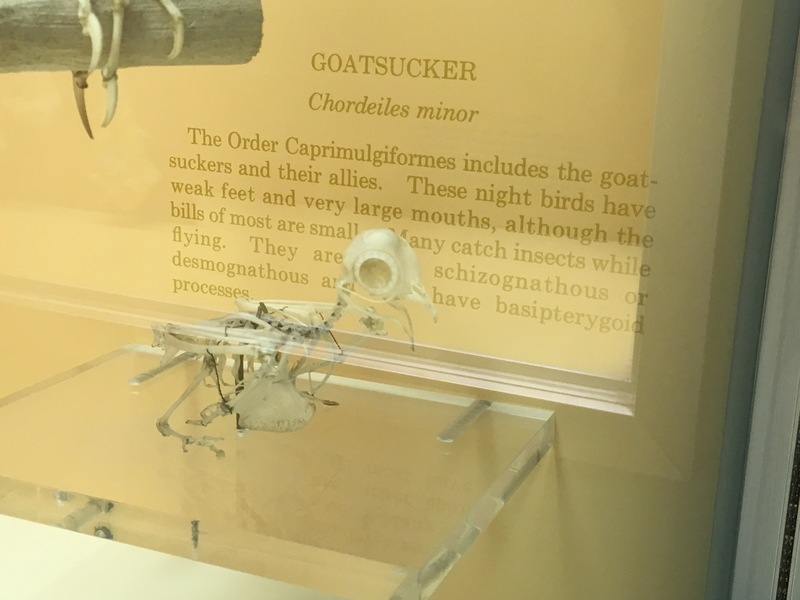 Lastly, I noticed their bill structure. Nighthawks have an open-ended jaw over which their skin membrane is stretched. Cuckoos and woodpeckers have a solid jaw. Woodpeckers would need a solid jaw to withstand the impact of drumming on a tree. Nighthawks are champions at heat dissipation. Having a thin membrane allows them to release heat from their mouths while panting or gular fluttering in their open hotter habitat. Woodpeckers and Cuckoos spend more time in their shadier arboreal habitats, and thus, have retained their solid jaws. If not, scroll down, for more on nighthawk heat tolerance.